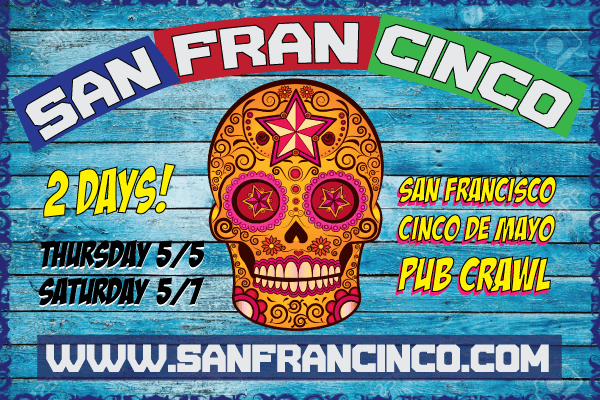 With over 2000 people at the CrawlSF St. Patrick’s Day Crawl, we couldn’t be more excited for the upcoming Cinco De Mayo Pub Crawl Celebration! This year, there will be two pub Crawls on Thursday, May 5 and Saturday, May 7. MAYE’S – BLUR – BITTER, BOCK & RYE – LUSH LOUNGE – VERTIGO – MCTEAGUE’S – and more! CHECK-IN: The check-in for the Pub Crawl will be at Maye’s from 2PM to 4:30PM. Please bring a copy of your order confirmation (you can also show us on your phone) and we will give you your Wristband and Pub Crawl Map. We will have a couple photographers at the Crawl and some other fun stuff. Feel free to wear a weird costume or do anything to make things even crazier for you!